Back in 2011 Melissa Mainville, who is working full time as a speech pathologist for Fauquier Health, received an invitation from a friend that changed her life. Kate Chrismer, a Little Fork paramedic, invited her friend to do a ride-along. 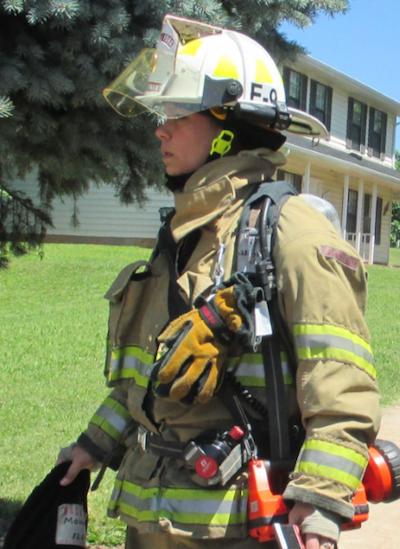 Eager to learn all that she could, Melissa took the EMT-basic class first, followed immediately by the Firefighter l class, and she was hooked! Next came Hazardous Materials Awareness and Operations, Firefighter ll, Fire Instructor Level l and ll, and Fire Officer l and ll. She was in the second group of people who took the Technical Large Animal Rescue Technician training. This semester she is taking EMT- Advanced to learn to provide a higher level of care, such as starting IV’s. She never stops learning and finding ways to improve her skills. This committed young woman, who worked hard and served innumerable hours over the next four years, was promoted to Lieutenant in 2015. 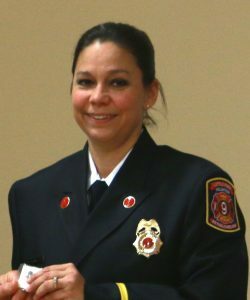 She now rides Officer on the fire truck, getting the apparatus to the scene, looking up the address on the map (no, they do not rely on GPS), assigning duties, maintaining safety awareness, tracking each crew member at all times, and communicating with the Chief. If it is an EMS call, she rides in the ambulance. She runs calls every night when she is not at work or at the barn with her horse, averaging over 300 calls a year. With a Master’s degree in Speech Language Pathology, Melissa fell in love with the medical aspect of the adult and geriatric population who needs speech therapy. She loves talking with people and listening to their stories. She works with stroke patients, medically complex patients in intensive care, and people with swallowing, speech, or language disorders. Melissa’s love for horses began in 2006 when she took a series of riding lessons. After riding, showing, and fox hunting with borrowed horses, she finally purchased her now 16-year-old mare, Ruthie, in 2010. It was her love of horses that prompted Melissa to take the Technical Large Animal Emergency Rescue (TLAER) course and get involved in the newly launched program at Little Fork.